Finding a one-of-a-kind antique doll at a garage sale is a great feeling--until you bring that doll home and discover it's haunted. Objects with restless spirits attached to them can quietly invade a home through auctions, antique dealers, estate sales, garage sales, and inheritance. 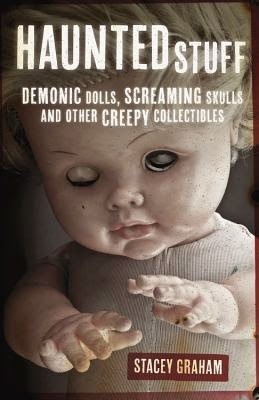 This spooky collection examines a wide variety of haunted items, from screaming skulls to demonic dolls, and how they affect the owner's life. Haunted Stuff provides true accounts of possessed possessions, often found in the strangest places. Discover chilling stories of the island of haunted dolls, the tumbling coffin, Rudolph Valentino's cursed ring, and even the Queen Mary ocean liner--one of the largest haunted items of all. Experience these true accounts that will make you look closer at the antiques on your shelf . . . and wonder if that creepy doll just blinked. I recently was in the mood for some non-fiction reading to break up the genre fiction I typically glut myself on so I picked up a copy of HAUNTED STUFF. I've always enjoyed stories of ghosts and hauntings and this one has lots of tales focusing on objects over places. From spooky ships to dolls with a violent streak these stories within were entertaining the way campfire stories are. Alas, I found that outside of the section on haunted skulls and bones I was already quite familiar with the majority of the stories. Not much was new to me and while all were interesting I just didn't get a lot from it. I would definitely recommend this for the novice ghost hunter or someone wanting to dabble into spine chilling content without anything too gorey.